The world of online slots is huge and incredibly varied and there are few places online you can experience such a massive selection of them than at SlotsMagic, an online casino that brings together some of the biggest and most popular slots on the internet today. And not only that, with their ‘’real cash’’ free spins, which do not have any wagering requirement meaning you can withdraw any winnings, to their same day cash-outs this is by far one of the best online casinos to play at for game selection and player friendly features. SlotsMagic features the cream of the crop of online slots all wrapped up in a very user-friendly and aesthetically pleasing package that you can enjoy either by downloading to your computer or via their high performance instant play version that runs from within your browser. Registering an account is quick and easy, then you’re free to dive right in to the selection of slots games, sorting them by number of paylines, jackpot or not, 3D, Classic or Video. The software itself is powered by SkillOnNet and they’ve worked hard to keep it fast-running yet taking up as little space on your computer as possible. The instant play version of course means there’s no need to download anything you don’t want to, making it issue-free in terms of compatibility. 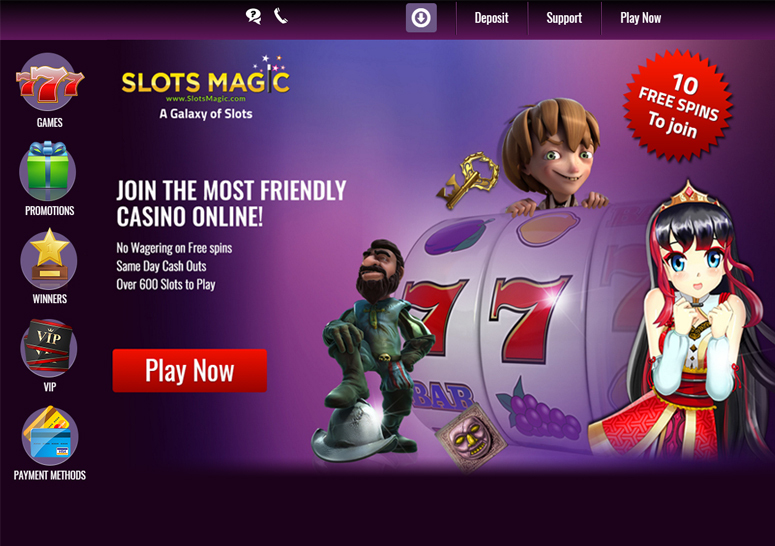 There is a simply staggering array of slots to play at Slots Magic and, as the site’s name suggests, this is the focal point of the offering. You’ll find everything here from 3D favourites to the totally unique, from multiple progressive jackpots to multiple sets of reels, superhero adventures to movie quality storylines, 1-3 payline classics to 50 payline monsters, and more special bonus features than you can imagine! SkillOnNet provide a lot of their own slot creations, such as Vampires Feast, Hot Wheels, Le Chocolatier, Moulin Rouge and Safe Hackers, all of which will push the boundaries when it comes to the typical style of slot play. WMS bring along some movie screen favourites such as Wizard of Oz, Star Trek, Bruce Lee, Zeus and Spartacus, while NetEnt add their own brand of slot play with a stunning range of involving slot games with gripping storylines and impressive bonus features. Video slots from other major game developers are available and included are Amaya, Microgaming, Bally, NextGen, Merkur and Aristocrat. However, if you do fancy a change, there is also a great selection of other gaming options, such as the variety of card and table games like Roulette, Blackjack, Baccarat, Caribbean Poker, Pai Gow Poker, Punto Banco, Casino Hold’em and many others. You can also access the Live Casino for a more realistic experience, enjoying the thrills of Roulette, Baccarat and Blackjack via webcam with a lady dealer controlling the action. Fans of video poker will also be spoiled for choice with the option to play up to 25 hands at once in the Video Poker section. SlotsMagic paves the way for player usability and player experience by introducing some brand new player features which are definitely going to make you love this casino. Combined with super-fast same day cash outs this online casino is massively recommended. In addition to being spoiled for choice in terms of games, you’ve also got a rich variety of promotional offers to jump on at SlotsMagic, all of which give you the chance to add a little extra to your gameplay. Take a look at the site’s Daily Picks section and you’ll quickly see at least 2 offers run every day of the month. These can include cashback deals, extra bonuses, chances to make a bit of extra cash on Roulette and Blackjack, money back just for playing, chances to earn extra VIP Points and many more. This is a page well worth bookmarking and referring to often if you really want the biggest bang for your buck. And of course, make sure you’re signed up to receive SlotsMagic’s emails as they often send out additional special offers that way. Slots Magic offers everyone the chance to play their great range of slots, regardless of where they are situated, as reflected by their huge selection of deposit methods, many of which are unique to specific countries. You can deposit using most major credit and debit cards, plus a whole host of online e-wallets such as Paypal, Skrill (Moneybookers), Trustly, Neteller and many others. If you need help at any point, you can always contact the friendly support team that’s available 24/7, every day of the year. They can be reached via phone, email and live chat, or you can check the site’s FAQ section. As the site and software are available in 22 languages, there is also multilingual support available.